After 1-2 stops of being squashed like sardines, we realize we are going the wrong way. The irony was that the other side was empty and by this time we could have been half way to Haliç, the stop for the Golden Horn. However we find ourselves at Laleli, which is on the way to Taksim, and decide to get off, and take the long walk to Vezneciler station. The excessive escalators do not seem so excessive minus the 15-20 kilograms of luggage we were hauling. We get off at Sishane, to go to a restaurant that also has a view of the Galata. We figure if we can find the river, we can find the restaurant.We are looking for Karaköy square. How hard could it be? It seems that people in Istanbul share the Indian sense of needing to provide an answer no matter what their level of expertise on the subject. We learn this the hard way, and while we enjoy our walk through the swankier part of town, we appear to be walking around in circles. We are getting hungry and are eager to find the restaurant soon. We change directions one last time, and find ourselves on Istiklal, one of the most famous streets of Istanbul, in search of several possible options recommended by our guide book – one of the the Haci Abdullah restaurant, one of the most famous and authentic Turkish Lokantas in Istanbul. 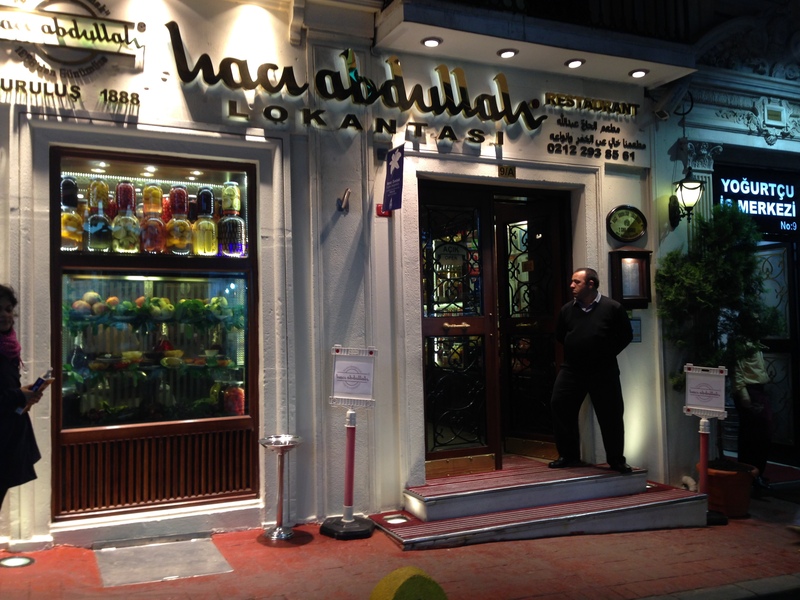 Serving Ottoman-Turkish cuisine, Haci Abdullah was started in 1888, at the end of the Ottoman empire, as Abdullah Efendi, in the Karaköy pier. Sultan Abdülhamid II used the restaurant as a space to host officials and private groups visiting Istanbul. It was moved to Beyoğlu in 1915, and moved again in 1940 and renamed to Haci Salih. The final move was in 1958 to Sakızağacı Street near the Ağa Mosque. In 1983 official requirements dictated it needed to take the name Abdullah, so it was renamed to Haci Abdullah. 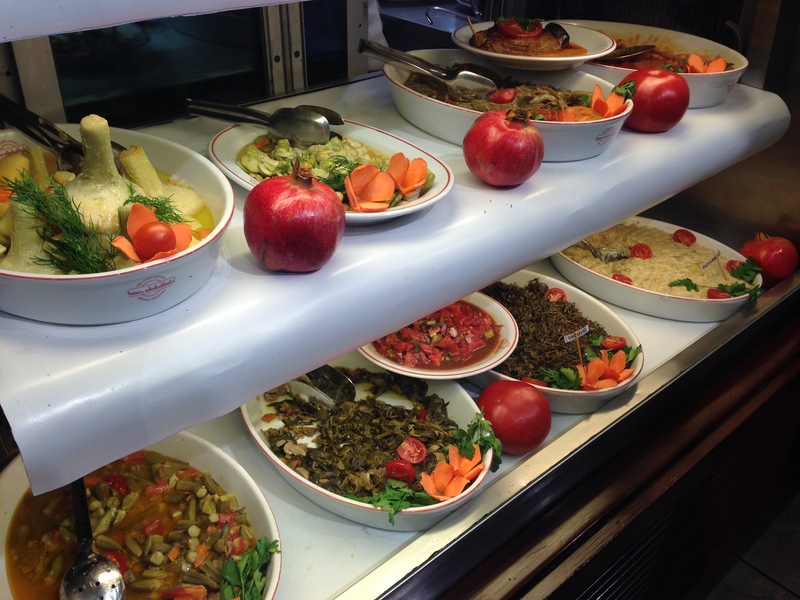 It is an Istanbul institution, and an absolute must if you come here. We are starving an crane our necks to see what others are eating. There seems to be a college reunion of sorts happening at the table next to us, and they provide us some recommendations through fits of laughter at old jokes and discussions on their own meals. I hear one of the ladies speak about how good the roasting meat smells, followed with “and I am a vegetarian!” again eliciting more chuckles. 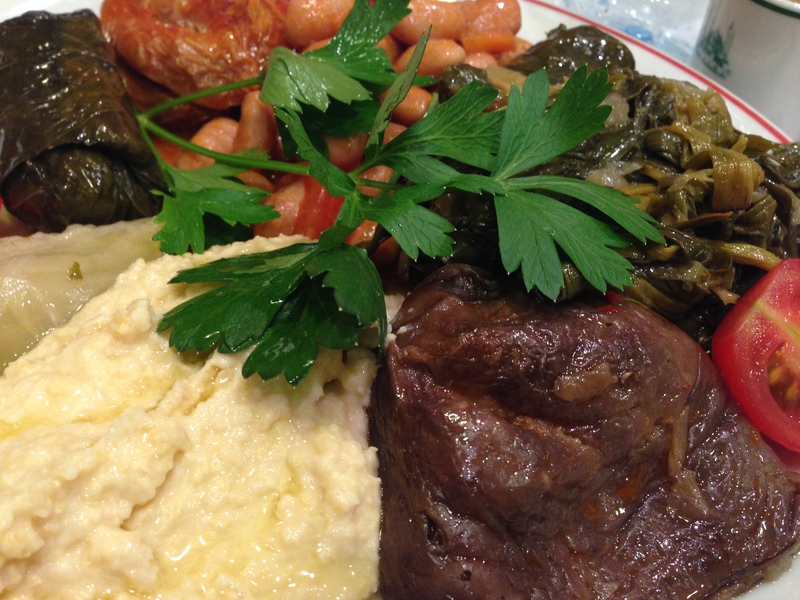 After some discussion with our server, we get a combination plate of cold appetizer type things – including stuffed eggplant, beans, spinach, hummus, and stuffed peppers. Everything is flavorful and delicious, and we wolf it down as we have been walking for so long, our bodies have no energy left. 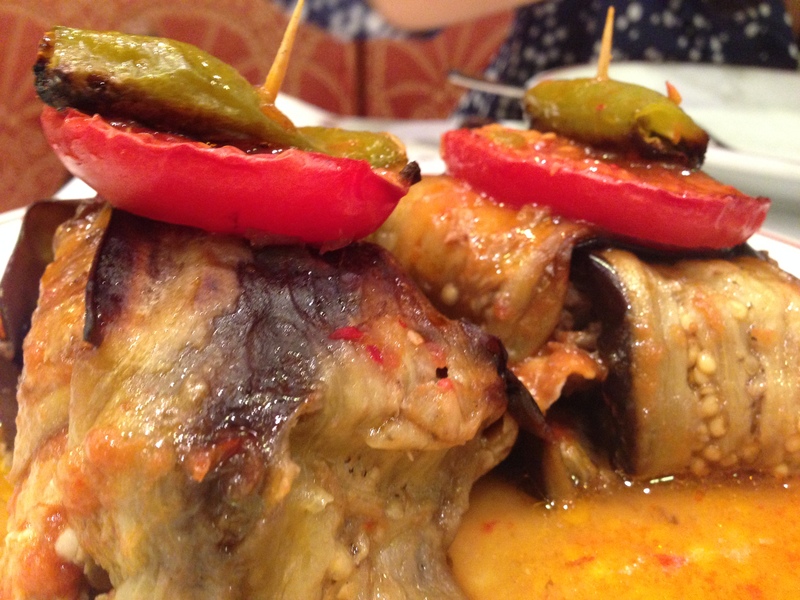 The real star is the lamb wrapped in eggplant – it is one of the most delicious things I have ever tasted. I’m almost disappointed I feel full, because I would like to savor the flavours just a little bit longer. After some Turkish chai, we have a short walk back along Istiklal to our hotel to the soundtrack of dance music pumping interspersed with some 90s hip hop. The drowsiness of food coma helps us block out the noise when we finally go to bed. Succint, and flavourful! I think you are having a good time. Wild guess!